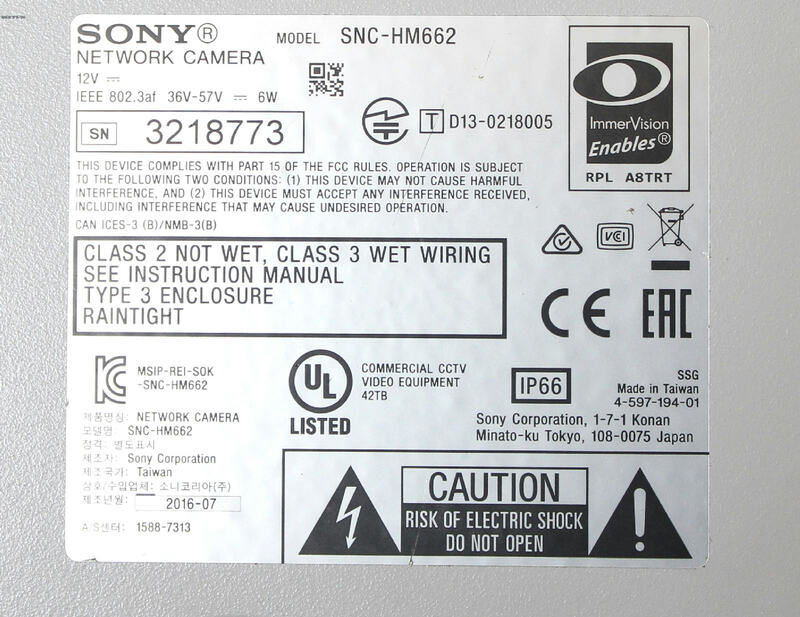 Up for sale is a used Sony IPELA HD Model SNC-HM662 Network Outdoor Camera IP66 5MP 360 View. It has been tested and the firmware has been upgraded to the latest version. 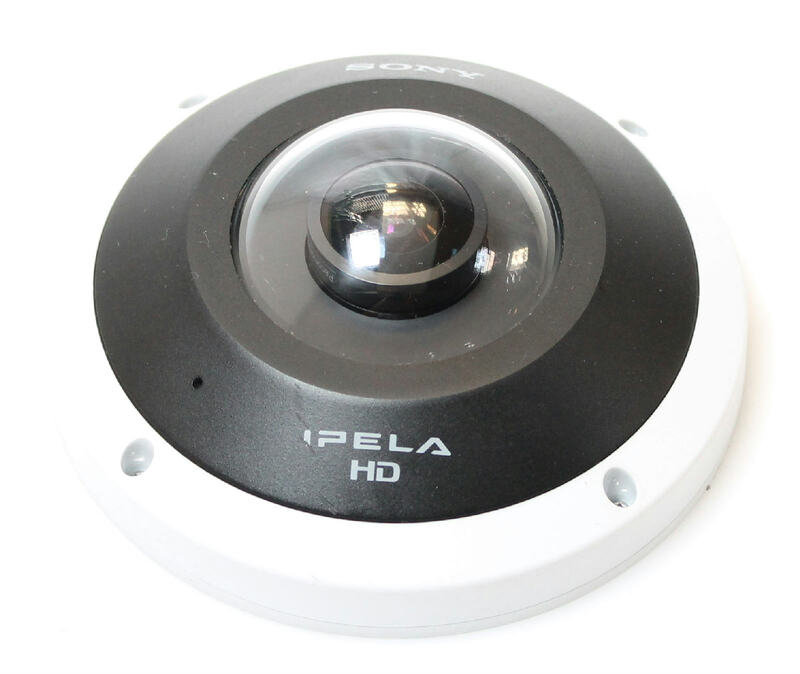 The SNC-HM662 IP network camera provides an uninterrupted 360-degree hemispheric field of view. It’s an ideal ‘overview camera’ solution for keeping a watchful eye over a wide range of indoor and outdoor environments – from lobbies, waiting rooms and retail spaces to car parks, campuses and commercial buildings. While ordinary fisheye lenses are commonly used for 360-degree wide-angle coverage, image quality is seriously degraded at the edge of the picture. The SNC-HM662 takes a radically different approach, using a unique panomorph lens by ImmerVision to capture a true hemispherical view with no blind spots. Video footage from the 5 megapixels sensor is crisp and clear right to the edge of the picture, with a frame-rate up to 13fps. The resulting 360-degree image can be automatically ‘dewarped’ to give a clear, undistorted view via Sony’s web browser client or a VMS (video management software) client application. Electronic pan/tilt/zoom (ePTZ) allows quick navigation to any part of the camera’s field of view for a closer look. The client applications offer a variety of view modes. These include the camera’s original 360-degree hemispheric view, as well as multiple simultaneous views produced from the same hemispheric image including a 180-degree panoramic view, quad view and 9-way split-screen. Even when one part of the scene is being reviewed in close-up on a client, the camera continues to stream the whole image to the recording platform. After recording, footage of the whole area can be re-examined. The operator has the same flexibility in play-back as in live-view, to zoom in on any part of the 360-degree scene for a closer look. Further refinements offered by the SNC-HM662 include two-way audio with a built-in microphone. Power over Ethernet (PoE) helps with simpler installation, while edge storage allows ‘no network’ recording to a removable memory card. Capable of operating over a wide -30C to +50C temperature range, the SNC-HM662 is also IP66 & IK10 rated for water and impact resistance, making it particularly suitable for use in outdoor applications.